December 2014 has seen the release of Some Some Unicorn and The Golden Periphery. The album is on bandcamp, and on Spotify. 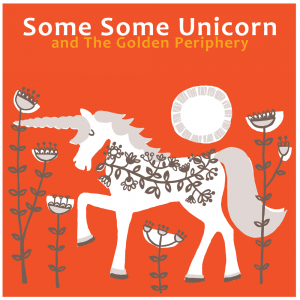 There’s a Some Some Unicorn website, which includes a reproduction of this album review that encapsulates The Golden Periphery quite well (for the original publication of that review, on a heavily advert laden site, see here). Featuring more than 20 musicians and sound artists, the idea is a complex one – none of them were in the same room at the same time. Cumbrian Ann Wilson reads on four of the tracks, her strong accent and descriptive, sometimes fantastical poems a highlight, adding yet another thought-provoking element to the record. Responding to an open call for participation in this Some Some Unicorn project, I did start working on four or five of the tracks in for the album, but only sent one contribution in the end. Nevertheless it was exciting to hear the album develop over consecutive iterations, and to find how my own additions came to sit with those of other contributors.